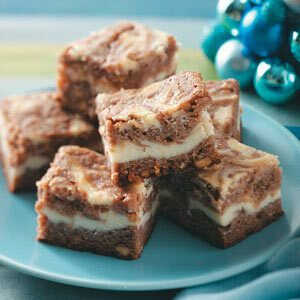 Cream cheese lends itself to a moist and chewy brownie bar that's finger-lickin' good! In a small bowl, beat the cream cheese, 1/2 cup sugar and milk until fluffy; set aside. In a large bowl, cream the butter, cocoa mix and remaining sugar until light and fluffy. Beat in eggs and vanilla. Stir in flour and nuts and mix well. Pour half into a greased 13-in. x 9-in. baking pan. Spread with the cream cheese mixture. Top with remaining batter. Cut through batter with a knife to swirl the cream cheese. Bake at 350° for 35-40 minutes or until a toothpick inserted near the center comes out clean. Cool on a wire rack. Cut into bars. Yield: 2-1/2 dozen.